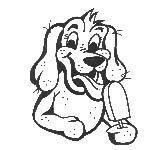 You have found the website of the famous "Dog Days of Summer Ice Cream"!!! We specialize and cater to Corporate/Business functions, Real Estate Open Houses, Day Cares, Weddings, Birthday parties, Town Fairs & other festive activities. Ice Cream trucks are ageless, everyone loves the sound of the music, ringing of the bell and the warm, fuzzy, nostalgic emotion from the experience. Please see our "price lists" for estimated cost and details. Also, see our product page for ice cream selections.